What is the #1 challenge HR professionals face? Increasing employee engagement. With the Gift of Choice Spot Recognition Gift Cards, it’s easy to recognize exceptional employee performance instantly. Simply add a special message and present the gift card presentation to the recipient. The recipient gets to choose one gift from hundreds of brand-name options in the level you selected to give. 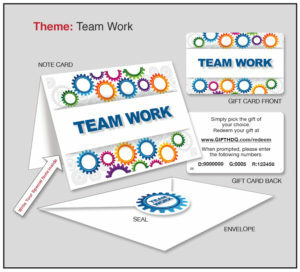 • Presentation includes a gift card, notecard, mailing envelope and adhesive seal.